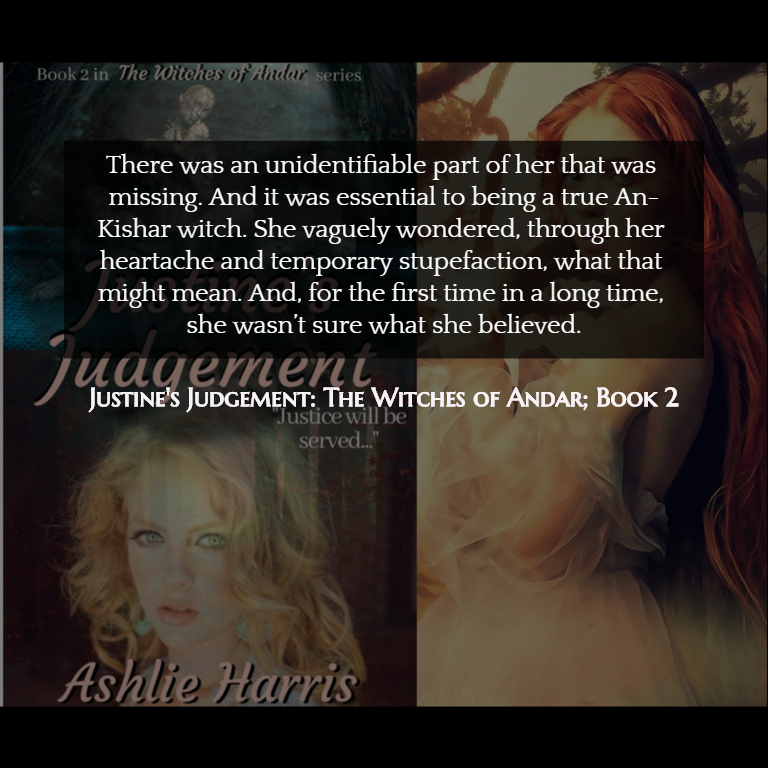 Justine’s Judgement is the second installment in a brand new Fantasy series by Ashlie Harris. 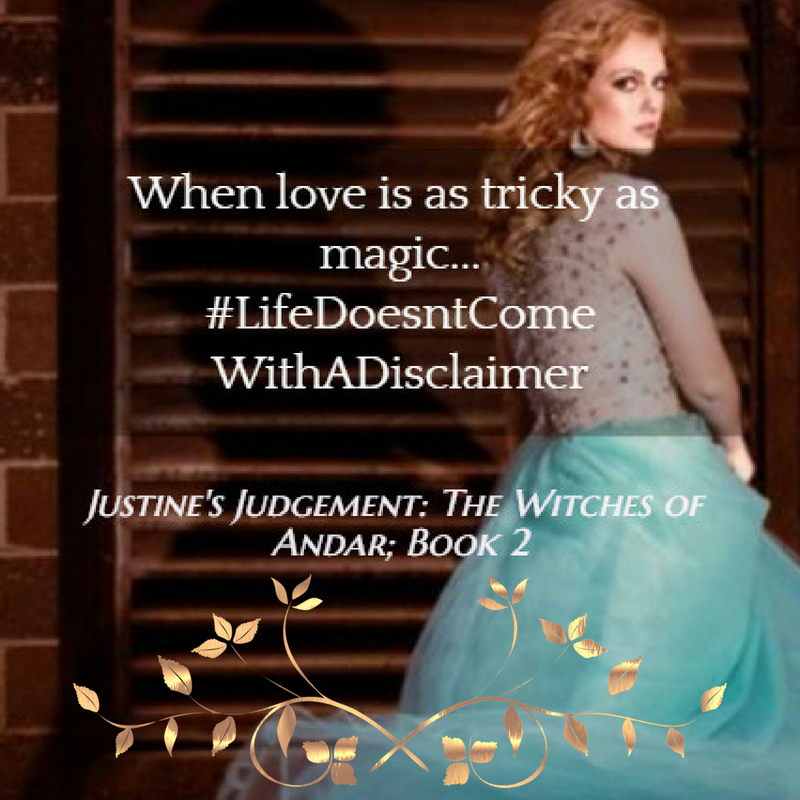 The first book, which bears the same name as the series itself, is entitled The Witches of Andar and was released January 1st, 2018. 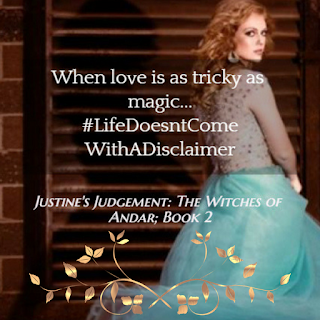 In this sequel to TWoA, Justine and her friends, Alice and Malinda, are once again fighting back against the evil Duke Ebrius. Evading and outwitting him at every turn, the witches team up with some very colorful characters along the way. There’s Jaicor, Malinda’s cousin and helpful aid to the witches in the early part of their journey. Jaicor’s wife, Marcine, is a delight, as well. Their witty banter is a heart-warming sight to the three travel-weary women. Later, the group encounters, Jaicor’s markethand, Olendian, and continues on to meet Malinda’s other cousin, Jaicor’s sister, Lady Luleth. Lady Luleth’s husband, Lord Kelton and Jehren, a member of their staff decide to help Malinda, Alice, and Justine when they come to Crippen Manor looking for allies. While devising a plan to defeat the Duke, Justine befriends a guest staying at the Manor. She is Eleyna, a mysterious and beautiful woman who quickly becomes a close confidant and ally. Though Justine and Eleyna form a fast bond, Eleyna’s motives may not be as pure as she portends. Uncovering secret pasts and unrecognized ancestries, not a soul will be left unchanged by the events about to take place. 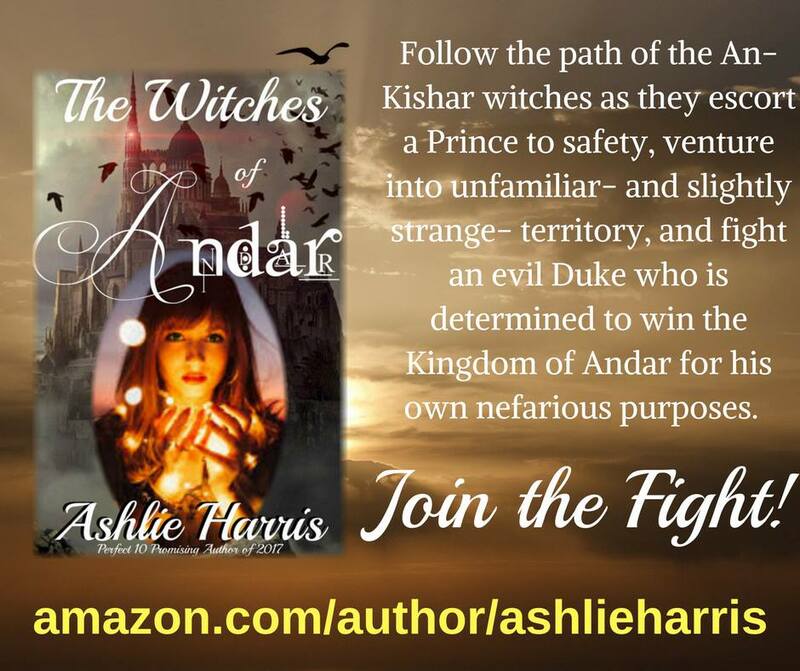 In the end, the witches and their friends will work together to bring down the greatest evil to ever threaten the land of Andar! The book cover was nominated for the AllAuthor.com Cover Contest for September!! 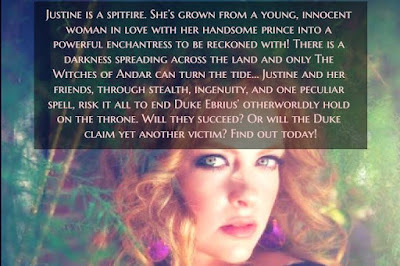 Please support the author and vote HERE! Justine, in her never-ending curiosity, pulled the dusty book from its cubby and began flipping gingerly through the pages. The ancient novel contained pictures and stories regarding the Gods and Goddess of the Old World. It had been many years since Malinda had seen one of these books and the images brought back many memories from her childhood. Her mother, reading these stories to her before bed, would tell them with such intensity that Malinda nearly believed them to be true and, to this day, still hadn’t fully discounted the possibility. After all, the An-Kishar had to have come from somewhere. Justine had flipped through nearly the entire book before stopping on one page in particular. “Look!” she said, jumping up and thrusting the book toward Malinda and Alice, “Someone’s written something, here in the margin.” She flipped the book back around and squinted, trying to read the minuscule scratches, “I can’t make it out,” she said, “It looks like someone was trying to find the site of the Anustians, though!” Malinda was amused at Justine’s bewilderment. 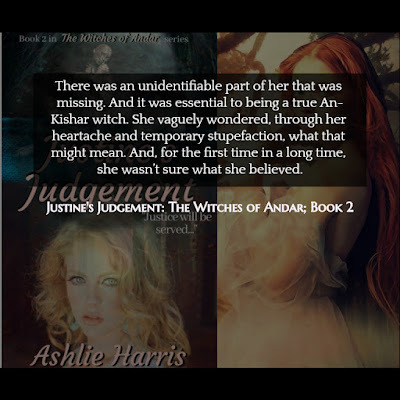 A trio of An-Kishar witches has unwittingly become involved in a royal coup. After saving the murdered king's son, the foursome takes shelter with a traveling theater troupe, hoping to stay in hiding until the Prince is able to reclaim his throne. Fight alongside Malinda, Alice, and Justine to rid the kingdom of the dark magic that threatens to run rampant. 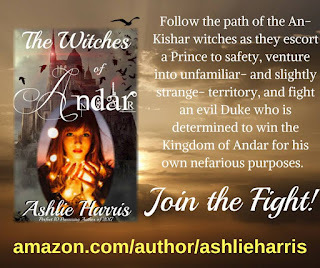 Venture into the Hanging Ferns Forest, travel with the Thespian Connection, and help unravel the mysteries that lie within the realm of Andar! Ashlie Harris is 30 years old and a Stay-at-Home mother of four homeschooled children. She and her husband live in the heart of the Midwest, USA, in a place Ashlie likes to call, "The Land of Corn and Beans". She has lived there all her life but may plan to move North in the near future. A unique childhood and a passion for the written word have served as motivation and inspiration throughout the years. Always the writer, Ashlie can often be found asking inappropriate questions, staring at seemingly nothing for hours on end, and generally being completely socially awkward. Her biggest wish is for people to look past their differences and start treating each other as the one, single race we are- HUMAN. In addition to The Witches of Andar series (Book 1-Released Jan. 1st, 2018. ), Ashlie is also the author of two anthologies- Extra Life & Circles of the Soul - and one flash-fiction horror story, Midnight Monster. I don’t like saying I don’t want to become a rich and famous author. It’s dishonest. In my opinion, anyone who is selling their books wants one of two things: 1- to spread a genuine message (and those books, let’s be honest, are usually free, so no getting rich there- except, through fame, perhaps). Or 2 - to become a rich and famous author. Some, admittedly, blur those lines- like those who become wealthy through the fame of their free books (let’s count how many times that’s happened). So, do I want to become rich and famous? Yes! While I don’t necessarily desire the ‘high-class’ lifestyle which might come to mind when speaking of someone rich and famous, I would definitely be happy being financially stable and able to provide for my family and others. I’m pretty sure that’s the underlying dream of nearly everyone who isn’t already at that point. The question which should be asked is ‘Do you believe your work deserves recognition?’ The answer to that is also, Yes. It’s not bragging when I say I’m a talented writer. It is a talent, much like singing or athletics. Yet, it’s also a skill, finely-tuned over many years of time-consuming hard work and endless hours of writing and rewriting (and rewriting, and rewriting....). When I was in the 6th grade I won the Young Author’s Best of School Award. It’s not at all prestigious or even really meaningful, except to me. It was the first time I realized not everyone could tell stories like I could. I was able to play to my audience and captivate grown adults… at the age of 12. When I won that award, I was really winning my future. I dreamed of being an author with every breath and every step I took. I wrote so many stories- and deleted even more - by the time I published my first book, I knew it was something special. Then, came the second book in the series and it was even better! A writer’s work is never truly finished they’re never truly at their best, because their best is always yet to come. Which is why, when you find those budding, unknown authors who’ve been able to captivate you, it’s important to support them. Let people know about the story you loved so much! Find them on social media and follow them. Leave a stellar 5-star review. Just letting them know you’re out there can make your favorite author’s day! thanks for the post, the book sounds very good! Thank you, Lacey! Best of luck in the Giveaway! Thank you, Andrea! Good luck in the Giveaway!!! Thanks, Robin! Best of luck today! I haven't read many Fantasy books but The Witches of Andar has an awesome cover and sounds like a good read! Thank you, Tracy! I hope you enjoy the story! Best of luck in the Giveaway! Thanks, Edye! I a big fan of green and purple. 😉 Good luck today! Thank you, Steph!!! Best of luck in the Giveaway! Thanks for sharing the awesome giveaway! You're welcome, Victoria! Good luck! Awesome blurb and cover. Makes me want to read the book. Thanks so much, Karen! I hope you'll enjoy the story. Best of luck today! The lighting on the cover is ominous. Thanks for the giveaway! Thank you, Christina! Good luck! Thank you for introducing a new author to me. I hope you'll enjoy the story, Bluecat! Best of luck in the Giveaway! love the mystical look of the cover. Thanks, Stacey! Enjoy the read and good luck today!